Surrender at 20: Red Post Collection: Champion Animation Dev Blog, Azir's Ult, Warmonger Sion being changed, and more! Red Post Collection: Champion Animation Dev Blog, Azir's Ult, Warmonger Sion being changed, and more! This morning's red post collection is massive! It features a new dev blog by Riot Lamz on champion animation, Meddler discussing the choice to make Azir's ultimate different from Nasus and Renekton, Scruffy noting feedback has been heard and the new Warmonger Sion is getting changes, Grumpy Monkey with Sion concepts and a pre-production model, and much, much more! Red Post Collection: Sion Update Discussion, Evelynn Texture Rebalancing, Inhibitor timers on SRU, and more! 9/26 PBE Update: Sion Voiceover & SFX, Gangplank Ult Change, Blitzcrank Texture Rebalancing, Hexakill: Twisted Treeline, and more! First up we have a new dev blog where RiotLamz runs us through the animation process, including examples from Yasuo's ultimate and Braum! "Hey guys - Rory “RiotLamz” Alderton here to take you through our champion animation process! Whether we’re chatting with players on the forums or at events, champion creation always seems to be a hot topic, so I figured I’d take some time to explain just how we go about making champions move. The first thing I need to point out is just how we animate. There are two techniques that the animation industry uses these days: hand key, and motion capture. You’ve probably seen videos of actors running around in body suits covered in reflective balls, right? That’s motion capture, which has been used in countless games and movies that look to establish photorealistic and lifelike characters. Then there’s hand keying, where animators hand-draw each frame of an animation. It’s a slower and more manual process that ultimately gives the animator more control over the finished animation. It’s often used in anime and superhero movies when animators want to over-emphasize the movement and contortions of a character beyond their skeleton’s limitations. So, can you guess which we use? It’s option b: hand-keyed animation. We settled on this technique years ago – before I joined – because it’s integral to maintaining our in-house style and helps us deliver smooth and instant animations that don’t affect League’s gameplay. Finally, hand-keyed animation allows us to implement several animation practices such as smear frames or squash and stretch all while maintaining iconic character silhouettes for gameplay readability. Alright. Let’s get into a few examples! Ultimates are often the single biggest abilities in the game in terms of visual and gameplay impact. Whether you’re getting guillotined in the face by Darius or bounced to death by Zac, the animations – the visual tells of the ability – need to be larger than life and highly readable. With that in mind, we had to really think about how we could animate Yasuo during Last Breath so that he felt suitably nimble and powerful during the ability’s one second - that’s 30 animation frames – cast time. For gameplay purposes it was absolutely vital the animation did not exceed this time. Ideas need to be approved as concepts before we start really animating them, so they need to be as clear, impactful and unique as possible. One early idea was to have Yasuo slicing his opponent upwards for the full second, but this wasn’t nearly impactful enough during playtests as he’d end up obscured behind the ability’s visual effects (VFX), and his poses were all contained in too small a space. You could barely see him, basically. Next we splined the animation, smoothing it out from still poses to fluid motion. At this stage, the animation almost looks like it could go into the game, although Yasuo’s hair and ropes – traditionally tedious things to animate – aren’t yet animated at all. Whilst it is common to manually animate these things on a final pass once the animator’s happy with the main body motion, we actually ended up pioneering some great new tech called ‘Jiggle Tech’. With it, we can set things to animate and react in real time to the motions of Yasuo’s body through simulating physics instantaneously in my animation tool, meaning we can rapidly iterate and make tweaks and changes without going through the tedious task of re-animating the hair and rope each time. Now that we have the bulk of the animation down, it’s time to start polishing. During this phase we like to include smear frames, where we stretch out the character and props to absurdly exaggerated proportions within single frames. This creates really fast blurs of motion and give the animation a snappy feel that show our anime and manga inspirations. 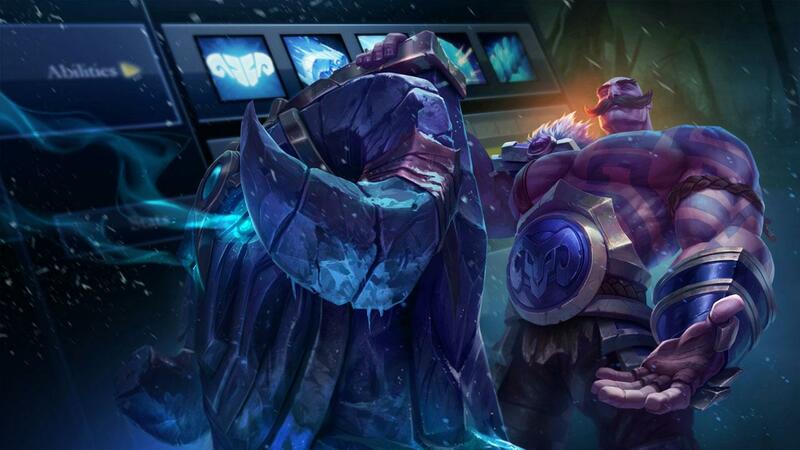 Braum carries a huge shield – actually an old door – around with him as he fights. This is a really cool concept, but meant we had to figure out exactly how Braum wields the thing as he attacks and uses his abilities. That said, the biggest challenge we found when animating him was in implementing his E, Unbreakable. It’s an intricate ability which Braum can use while he moves and uses his other abilities, which meant we had to merge various animations to create a 360-degree movement and attack system. Here’s how we went about animating the Heart of the Freljord’s most iconic ability. First we had to find a strong and defensive base pose for Unbreakable, from which we could branch off into Braum’s other movements. After trying a few poses out, we went for a one handed, shield-planted-on-the-floor pose when stationary, leaving one of Braum’s fists free for his shield attack animations. As a final flavor pass we also included our in-house Jiggle Tech on several of Braum’s accessories like the necklace and rope! This gave some additional secondary animation which complimented the main animation nicely and gave a more overall polished touch. Finally, one of my personal favorites is Braum’s ultimate, which is a great example of the various elements I’ve talked about above coming together to create an epic in-game moment. That’s about it for now! Hopefully I’ve given you some insight into how our champion animation process works here at Riot. We’re always striving to raise the bar for each other and ourselves, because introducing new tech and better work into the game creates interesting and exciting challenges for all disciplines involved. I truly believe in the phrase “technology pushes art and art pushes technology”. Some of the early ultimates we looked out for Azir were based off the 'Get big and AOE theme' that Nasus and Renekton both share - we also thought the thematic link would be really cool. We eventually concluded, after trying a few (some of which involved an Ascension ritual to trigger, some of which were instant on button press) that that wouldn't be a good direction for the Azir we wanted to make. We were aiming for an emperor who commanded, rather than someone who was focused on getting into the middle of the fight. Additionally the versions of giant sandstorm AOE that we felt had the most potential ended up being very reminiscent of Fiddle and Kennen's ults (cool skills, but we wanted to do something different with Azir, both to give him a distinct identity and to preserve Fiddle and Kennen's). "Yeah, there are definitely some ways you could do sandstorm as a theme in game that would add something new. Trying to do so on a champion centered effect on the other hand's a lot harder. We don't have any plans for one at present but I could imagine us doing another sand themed champion someday, provided he/she/it was sufficiently different from Azir. Some form of desert dwelling creature with sand manipulation powers or a sand wraith/elemental perhaps, almost certainly in a different role than mage." "Not sure if he's the most difficult, he's right up there though. A lot of engineering work went into him (big thanks to our champion team engineers!) since his passive, soldiers replacing his auto attacks and his ult all have functionality we didn't previously have in game. On the design side his scripts (how his abilities function, created with our internal tools rather than programmed directly) are also very complex. Most difficult to implement title probably goes to Zac at a guess. Not so much for his kit (which did have a bit of tech for the E but nothing enormous) but on the art side. Lot of animation and visual effects tech was developed for him (most of which has also been of great use on other champions since - much easier to justify that sort of work if it'll be reusable)." In a reddit thread discussing rune page options, Hippalus stepped in to confirm there will be another sale on rune pages before the end of the year! "Relatively soon™. Absolutely definitely without question before the end of the year." In a thread asking about Spirit Guard Udyr's unique champion taunts (for Nidalee, Anivia, Rammus, and Volibear) and why they do not trigger reliably if at all, Riot Eno commented that the team is aware of the issue and is working on a fix! So, I was unaware of this, but never fear, this is a known issue that some other audio bros are aware of. The fix is on the short-term To-Do List, and should happen in a few patch cycles. Thanks for bearing with us! There aren't many of us sound folks, but we really do check these forums, Reddit, Twitter, etc to make sure you guys are happy. It might take us a little while to get things fixed now and again, but it's not because we don't care; we're usually neck deep in new stuff, as well as trying to address bugs, and older issues a the same time. Your level of patience with us is pretty stellar, so, thank you!! =)"
Warmonger Sion changes on the way! "We currently have a 3D artist working on moving the texture more towards the original. We'll be looking at that today in a review and we'll see where it's at." With Sion's update out and on the PBE, Grumpy Monkey popped up on twitter to share a look at the pre-production Sion model he sculpted. Note the model underwent several changes before becoming the Sion we've been axing around with! "Pre-production shot of Sion. Sculpt by me, Concept by Josh Smith. We had to change him a bit. #LeagueOfLegends"
"Here is a quick turnaround of the sculpt. We had to tone down the gore for international reasons. 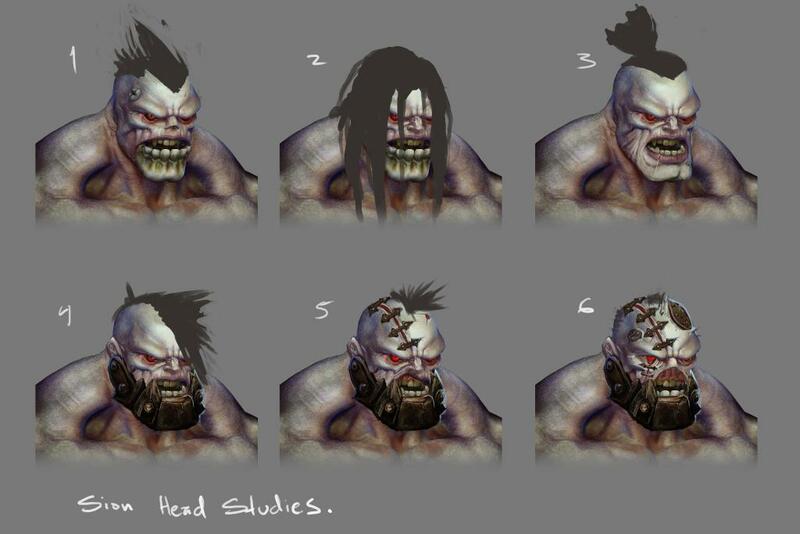 http://vimeo.com/107311322 #Vimeo"
"Here are some early head studies we did for Sion #LeagueOfLegends "
"A lot of the analysis in this thread is on point. Sion's mind is the most fragile part of him, something which a mastermind like Swain can easily exploit. When Sion can glimpse the truth, he doesn't like what he sees. Fortunately for his manipulators, that clarity is fleeting. Think of taunts toward an enemy Swain as written to reflect the moments where Sion recognizes the truth. As for Swain being a counter, well, it's gonna be hard to break that leash." From Sion's update to Braum and Yasuo, one keen eyed summoner commented on the new Story & Art boards regarding just how many champions wear an armor piece on only one of their shoulders. Sometime it makes sense, such as an archer's arm being covered for protection, or a falconer's glove. Maybe a large shoulder pad for checking into people. I have a love/hate relationship with symmetry. On one hand I really like making things cohesive and elegant, but I also love things that cut across characters breaking symmetry, adding secondary detail. I'll say I'm less fond of doing for asymmetry's sake, though I'm guilty of that too! All depends on the read you feel like giving the character, and how organized and put-together they should seem."